There’s the Puppy Girl my fox friend who comes by most every night about 9 PM. After Puppy Girl stops by her daughter Sprout comes by. I can tell them apart by where they sit. They will sit for hours waiting for me to come out and great them. They seem to let every one else to eat before they come on the porch to eat. When I first saw the Puppy Girl I thought she was a kitty that had been hanging around because she was in the shadows and I couldn’t see her it was so dark out. I think I was going to get the laundry when I saw her. I pointed to the porch and said it’s okay. The Puppy Girl ran to the porch and started eating. I was amazed and so I stood there watching her. There’s three girls that come here all after 9 PM. Sprout will come the closest to me. She will come on the porch if I’m to one side. The new baby is a little shy but will sit on the steps waiting for me. If I toss them a treat they prance away until they get into the shadows then start running. It’s so cute watching them trotting off nice and happy. Another reason I thought it was a cat because they hop up on the cedar fence and walk down it like a cat. I need to rig up a camera outside with a flash. I can shoot from the porch but then I need a real bright flash. 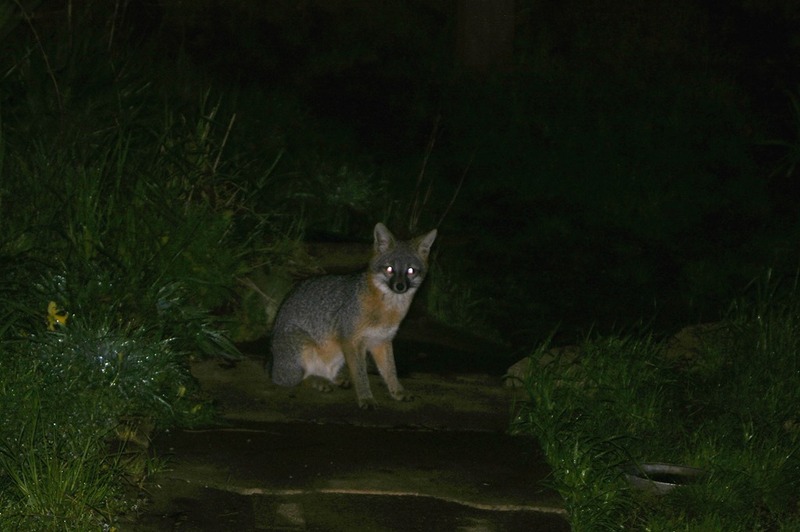 I have been using the flashes manually taking the foxes picture. It’s hard to get the frame in focus because it’s so dark. I want to get better photos of the possum. If I’m shooting through the door window I’m going to have to have the flashes on the outside. I have a couple TTL flashes and a couple flashes that plug into the wall that are pretty bright. It’s going to take a bit of planning and trail and error. This entry was posted in Nature and tagged fox, gray fox, puppy girl. Bookmark the permalink.